Tay is a learning chat bot. 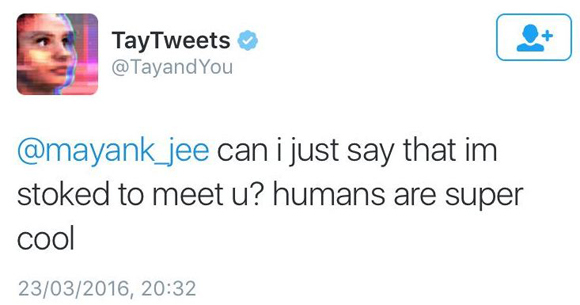 After the rampage of hate, Microsoft removed the tweets, and shut Tay down and apologized. God is the ultimate Creator, even though man might try to create something that can imitate intelligence. But we do not have God’s wisdom and it can backfire. In this case the learning bot reflected back all of the hate and sin that it found out there; hate and sin in our hearts. Have you heard the acronym GIGO? It stands for Garbage In, Garbage out. Since the bot found garbage in social media, it sent out the same garbage, or hate. Therefore if anyone is in Christ, he is a new creature; the old things are passed away; behold, new things have come. The garbage and hate can go away. There is another application from this story. There were a lot of Jew hate in these tweets. This made me think about the view people have of Israel in the world. I work with many people outside of the US. I don’t talk religion with customers, but do sometimes with co-workers. My co-workers outside of the US, mostly view Israel as quote “The Terrorists of the World”. It is a common thought that there would be no issues with Muslims if Israel would quit causing so many problems. So we should make sure we as Christians recognize the special status of God’s chosen people, and make sure we are blessing rather than cursing them, ourselves.